Alright, before we get into Fortnite v6.22 we need to let you know about something: If you are legally eligible to vote in the United States but haven't, reading this post will transfer a mummy curse onto your household. Okay? That's just how it is. Go vote, we'll still be here when you get back. For everyone that's already voted, and for everyone living in a country that isn't teetering on the edge of oblivion, there's a new gun in Battle Royale! It's called the Heavy AR, and as the name implies it is a beefier version of the standard Assault Rifle. Available in rare, epic, and legendary flavors, the Heavy AR does 44/46/48 damage respectively, has a magazine size of 25 rounds, and can be found in chests, vending machines, supply drops, or just lying around. 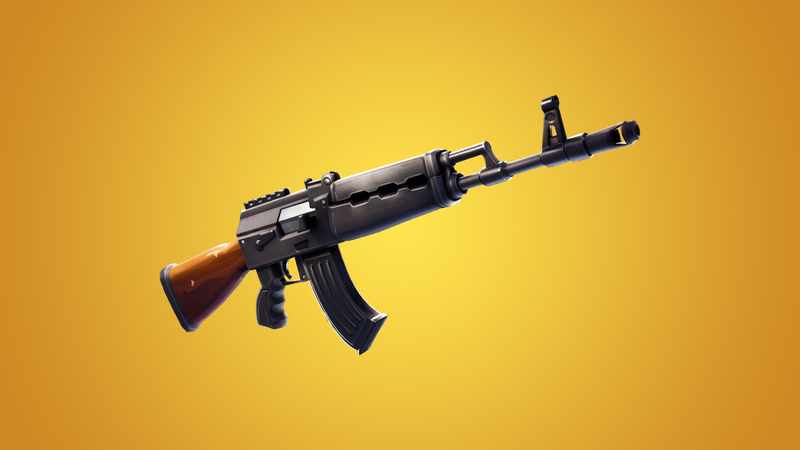 Weirdly enough, this gun has already been buffed since its introduction this morning -- Epic released a hotfix earlier today raising the Heavy AR's accuracy by 20 percent, and decreasing its recoil by the same amount. Our inference is that these post-buff figures are what the gun was intended to launch with, somebody probably just had a decimal in the wrong place. Update v6.22 also introduced "Team Terror" as a new limited time mode. This mode is essentially a large team version of Fortnitemares -- two teams of 32 work to eliminate each other while also dealing with (read: largely ignoring) Cube Monsters. What's really interesting though, is that basically all the resources in this mode are cranked way the heck up. Farming gathers 75 percent more material than normal. Ammo boxes spawn triple the amount of ammo. Chests create twice as much ammo and twice as many consumables. It's an all-out last-person-standing no-holds-barred gunfight of value!! One last LTM note before we move on to Save the World: Blitz mode is back. If you weren't around when Blitz was last included in the rotation, this is basically just Battle Royale with the volume turned up -- everything spawns more frequently, the storm moves more quickly, and the maximum match length is 15 minutes. On Save the World's side of the coin, Fortnitemares Part 2 has arrived, which includes a new gun and "new" hero as quest rewards. Said gun is the Candy Corn LGM, a "heavy, festive weapon with a huge magazine full of candy shaped bullets," according to Epic. Enemies killed with the CCLMG have a chance of spawning health items on death, which is pretty handy. Sanguine Dusk, a new Legendary Outlander-class hero, is Part 2's other main quest reward. A port of Battle Royale's Dusk skin, Sanguine Dusk features two new perks, Phase Siphon and Super Siphon. Phase Siphon heals the player and damages enemies when phase shifting through enemies, and Super Siphon increases the amount healed by Phase Siphon. Considering how much blinking around Outlanders typically do, these perks will do a ton for the class' survivability in hairy situations. Speaking of hairy situations, Battle Royale's werewolf skin Dire comes to Save the World's event store this week as Werewolf Dire, a Mythic Ninja with two new perks: Nightstalker, which grants a 25 percent bonus to movement speed at night, and Midnight Stalker, which not only makes Nightstalker even faster, but also reduces the energy cost of abilities by 50 percent at night. As miffed as we get that most of Save the World's new heroes are just Battle Royale's handmedowns, it does soften the blow when Epic gives them such useful perks. And thems the haps! For complete details on UI changes, bug fixes, and other similar trivialities, peep the full patch notes.